A fun Children’s Meditation on the importance of the Holy Spirit and why God wishes us to be healed. 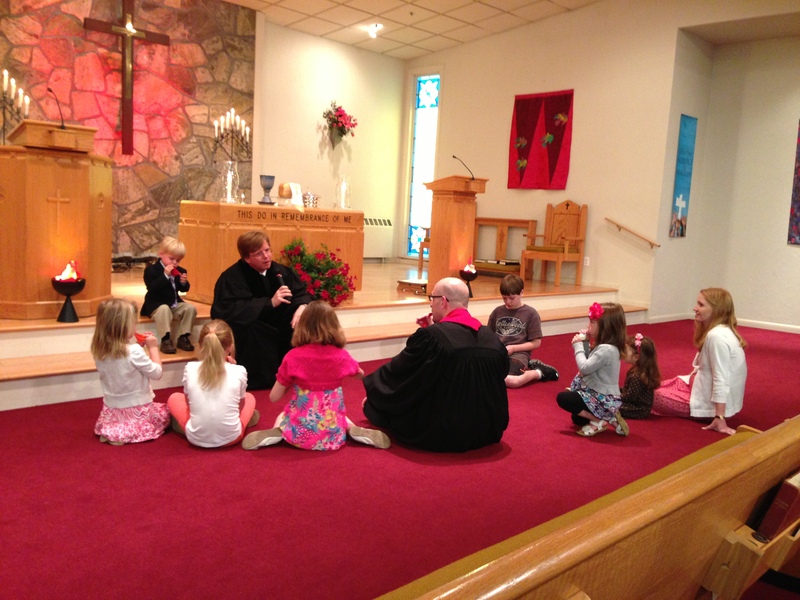 A fun Children’s Meditation that gets the congregation as a whole involved in presenting the message. The lesson is on the importance of the Holy Spirit and that God wishes us to be healed so that we can share the Holy Spirit with others. The suggested quantities of balloons are for a group of 12-15 children, with a generous “margin of safety” so that no one is left out if more than the expected number show up! Inflate roughly 2/3rds of the balloons (around 50 or so) and place them in black plastic trash bags that are tied shut in a way that is easy to open (i.e., with a bow or half loop). I recommend roughly 12 balloons per trash bag, don’t inflate them so far that they would easily pop! Give yourself plenty of time to prepare the balloons, especially if limber fingers and strong lungs are not available to help! Out of view of any children, hand the bags of inflated balloons to the ushers (or other responsible adults), instructing them to distribute the balloons as surreptitiously as possible to the adults in the congregation as soon as the children are called up for the Children’s message. You may want to show the ushers how the trash bags are meant to be opened (to avoid unnecessary fussing when it is time to distribute them). You may want to distribute one bag of balloons to the choir ahead of time, or have someone in the choir quietly distribute them during the children’s message. Keep the bag of “wounded balloons” with you. Ask them about the Holy Spirit, the Meaning of Pentecost, etc. Point out that the Holy Spirit is seen as “wind” in Acts 2, and that the Spirit is often compared to wind or breath in the Bible. Once the stream of comments and questions begins to slow, pull out the “wounded balloons” and distribute them to the children, inviting them to fill them with the “Holy Spirit” by blowing into them. Obviously this won’t work, as they will quickly discover (although some of the older and more inventive kids may figure out how to plug the holes with their hands)! Some of the younger kids may well be so distracted by the balloons that they don’t pay much attention – oh well! Observe that the balloons are injured or wounded, and that because of that, they cannot contain the Holy Spirit as they should. Talk about how God wants us to be healed in our own spirits, so that we are able to be filled with the Holy Spirit and not “lose” it by being so focused on our own wounds that we forget why the Holy Spirit is given to us by God (to share it with others). Invite the children to leave for Sunday School (if that is your plan), but first, on their way out, tell them that they need to find the Holy Spirit for themselves among the congregation, because we are all meant to share the Holy Spirit with each other. This will generate several minutes of confusion and glee, as the kids run around the congregation – including (hopefully) among the choir members, receiving their gifts of “Holy Spirit Balloons” from the congregation. The “emergency reserve balloons” are meant to be handed out to those children (especially the younger ones) who do not get a balloon at all, or who accidentally pop their balloons.